Cambridge University says it needs the "support of schools and parents" to help increase the number of black British students it enrols. The university told the newspaper it would not be able to improve diversity "on its own". 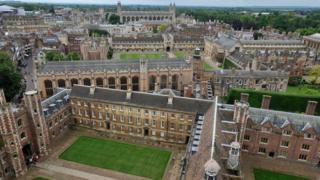 The figures follow criticism of Oxford University for similar failings. Of Cambridge's 29 undergraduate colleges, six admitted fewer than 10 black British or mixed-race students between 2012 and 2016. One college, St Edmund's, received applications from more than 30 prospective black students - but failed to make an offer to any of them. Downing College made between eight and 12 offers, out of a total of 95 applications. A statement to the newspaper from the university read: "More needs to be done to prepare high-achieving black students for applications to Cambridge and Oxford, which is why we have significantly increased the funding we contribute to programmes like Target Oxbridge." 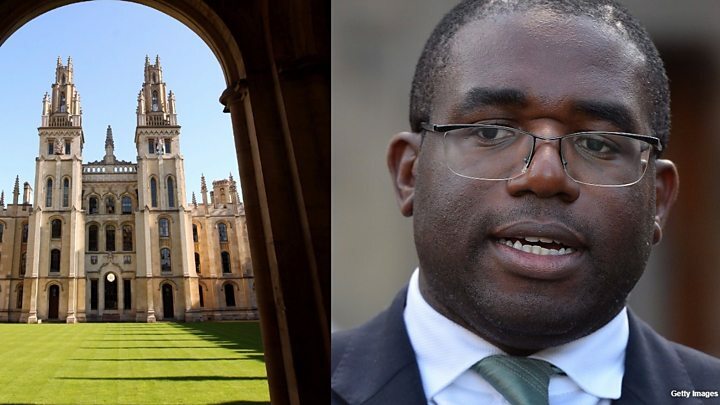 Labour MP David Lammy has called for every university in the UK to publish its annual admissions data, in order to promote transparency. After reading Oxford's report into its own admissions data, Mr Lammy told the BBC that Oxford was "failing badly" in its efforts to improve diversity. Speaking to Radio 4's Today programme, Mr Lammy said the university had to explain why - having looked at the data - a person was twice as likely to get in if they were white, not black. Mr Lammy previously accused the university of "social apartheid", after an FoI request by him revealed 10 out of 32 Oxford colleges did not award a place to any black British pupil with A-levels in 2015. This prompted more than 100 MPs to write to Oxford and Cambridge urging the universities to recruit more students from disadvantaged and under-represented backgrounds. Reacting to Oxford's own report, Mr Lammy said the problem was "self-perpetuating". "If you're on the 20th floor of a tower block estate and you're getting straight A's, you apply, go for a difficult interview.. you don't get in, then none of the other kids apply the following year."